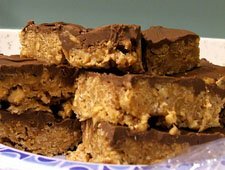 This recipe for Special K Bars is from Donna H back in 1996. It was probably gotten off the box of cereal. So yummy and kids really like it. An easy dessert to take to a party. In medium sauce pan heat syrup and sugar together till melted - do not boil. Stir in peanut butter. Add cereal and stir until cereal is coated. Grease a 13x9 pan and press cereal mix into pan. Melt together the chocolate and butterscotch chips and smooth over the cereal. Allow to cool and cut into desired serving size.